This is the third in a series that has become real-life examples of taxonomies found in my kitchen. 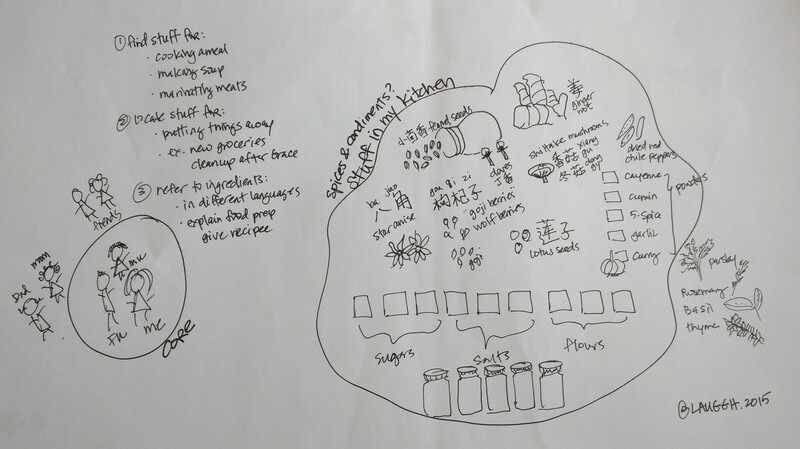 Part 3 of “Taxonomy of Spices and Pantries” looks at where and how facets can be used as multiple categories for content. Using my disorganized kitchen as an analogy, I outlined in part 1 the business reasons why a kitchen redesign needed to focus on taxonomy. I’ve moved often and content migration gets pretty ugly in the pantry. After a while, content creators are quick to stuff things into the nearest crammable crevice (until we move again and the IA is called upon to reorganize). 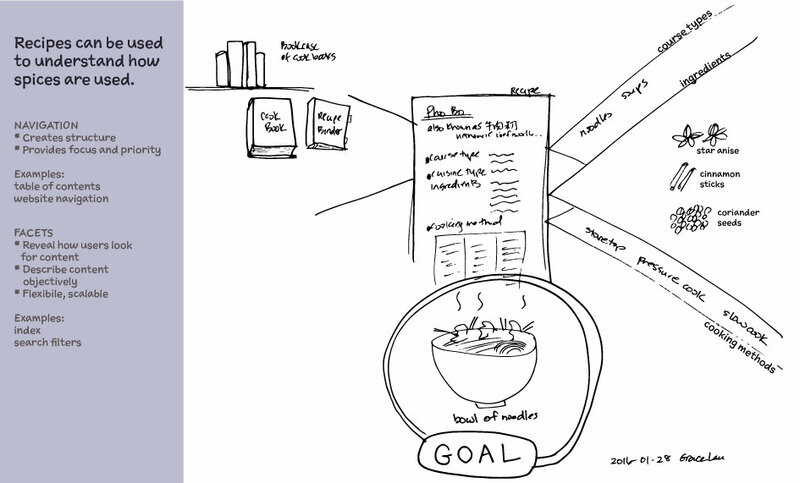 In part 2, I started planning and outlining the scope of this kitchen taxonomy project. Who are its users and core stakeholders? How do they move around the kitchen? What content in this domain would be covered in this taxonomy and where do we draw the line? However, a simple list of pantry and spice categories is not enough to demonstrate the potential of taxonomies. A neatly organized spice drawer doesn’t represent a sound taxonomy unless there lies some underlying understanding of how the spices are used and in what context. In part 1, I enumerated the business reasons for a taxonomy focus in a site redesign and gave a fun way to explain taxonomy. The kitchen isn’t going to organize itself, so the analogy continues. I’ve moved every couple of years and it shows in the kitchen. Half-used containers of ground pepper. Scattered bags of star anise. Multiple bags of ground and whole cumin. After a while, people are quick to stuff things into the nearest crammable crevice (until we move again and the IA is called upon to organize the kitchen). Planning a taxonomy covers the same questions as planning any UX project. Understanding the users and their tasks and needs is a foundation for all things UX. This article will go through the questions you should consider when planning a kitchen, er, um…, a taxonomy project. Your users can’t find anything. You have too much content. Your hopeful answer to everything is to rely on an external search engine, not the one that’s on your site. Google will find everything for you. A typical site redesign project might include refreshing the visual design, considering the best interaction practices, and conducting usability testing. But what’s missing? Creating the taxonomy. Would you rather take a photo using your phone, a point-and-shoot camera, or a digital SLR? How you answer this question is probably a good indicator of your photographic expertise. If you snap casual shots, your phone or a point-and-shoot camera will probably suffice. If you’re a professional photographer, on the other hand, you probably prefer using an SLR that gives you control over the focus, aperture, and exposure. Expertise significantly impacts how we seek information online. Just as novice and expert photographers prefer different tools, so novices and experts behave differently when searching for information. Understanding these differences will help us design better search interfaces for both groups of users. * *Angela Baer*, since completing her MFA at Pratt 5 years ago, is quickly building a reputation as one of New York’s up-and-coming fashion photographers. In the office connected to her studio, Angela edits her photographs on two large monitors and top-end computer. She delivers the edited shoots electronically to her clients, and regularly updates her online portfolio and blog. Angela is highly proficient using her computer, and when it comes to photography, she’s a domain expert. * Though officially retiring over 10 years ago after a successful career in banking, *William Hayes* still sits on the board of a number of financial institutions. From his Elizabethan cottage on the Kent coast, he uses a 5-year old computer to exchange emails and access financial reports, though he prefers doing business on the phone and keeping up with the world though The Financial Times. While William is a domain expert when it comes to finance, his technical expertise is lacking. * 18-year-old *Fane Tomescu* helps run an internet cafe in Braşov, Romania. Having saved for over a year, Fane recently came across a car that he’s considering purchasing. But when the time came to arrange car insurance, Fane had no clue how things worked. He asked his parents and friends for advice, and then spent several hours comparing providers online. Fane is a technical expert, but when it comes to insurance, he’s a domain novice. * *Claire Jones* is a 9-year-old from Colorado Springs. Her school is holding a science fair and Claire has decided to build a model of the solar system using styrofoam balls suspended with string. Having left her science textbook in her locker over the weekend she was meant to start building the model, Claire used the internet to lookup information on the order, size, and appearance of each planet. Though she did eventually find what she was looking for (with her parents help), Claire would be considered both a technical and a domain novice. While either dimension of expertise is valuable, users are most likely to succeed when both are present. There are, however, a number of design guidelines which can help both novices and experts succeed in their pursuit of knowledge. Image 2: An orienteer at the 2010 World Orienteering Championships in Trondheim, Norway. Photo by Torben Utzon. Wayfinding is a challenge as old as humankind, but the discipline of orienteering originated in the Swedish military in the 1800s and is now a sport practiced throughout Scandinavia. Equipped with a map and compass, participants navigate between control points spread across many miles, making tradeoffs between distance and difficult terrain as they strive to complete the course in the shortest amount of time. The strategies employed by novice users seeking information resemble the sport of orienteering. Users with low levels of domain and technical expertise, typified by Claire Jones, share three main characteristics. Novices tend to enter queries that use about half as many words as experts. Domain novices (like both Claire and Fane Tomescu), feel particularly unsure of which terms to use. Novices perform more queries than experts, but look at fewer documents. Although they frequently reformulate their query, technical novices often suffer from an anchoring bias  and make only small, inconsequential changes. Novices are much more likely than experts to hit dead ends and seek to get back to a previous state. There are a number of design considerations which can help novice users succeed at orienteering. In particular, novices need help formulating their query, refining their query, and backing out of trouble. As-you-type suggestions can help users get off on the right foot when they’re uncertain what to search for. Research has shown  that users are more capable of choosing a viable option from a list than they are of composing a question out of thin air. Autosuggest provides an opportunity to help users express specific terms (such as airports or stocks), and to suggest queries that other users have performed in the past. After users have performed an initial search, they may still need help refining the query. A list of related searches can help the user break out of their anchoring bias and help them arrive at the optimal set of results. If the user is presented with no search results, he may be disheartened enough to give up his quest. Avoid zero-result screens if possible. Tools such as automatic spelling corrections and query expansion (using synonyms and lemmatisation, for instance) can help. Because novices tend to take wrong turns, they often need help navigating back to a previous state. Breadcrumbs are an ideal solution because they communicate both the user’s current location, as well as how to go back. Image 7: In Star Trek, crew members of the USS Enterprise stand on transporter platforms to be beamed down to a nearby planet. While novices orienteer, experts teleport. Akin to being teleported to a precise but distant location, users with high domain and technical expertise like Angela Baer tend to jump directly to their final destination. Experts enter longer, more specific queries than novices. Domain experts like William Hayes often rely on their vocabulary of specific terminology, while technical experts such as Fane Tomescu are more likely than novices to use formatting techniques such as quotation marks in their queries (87% of experts compared with 47% of novices according to a 2000 study ). Experts usually amend their queries less often than novices and move forward with a higher degree of confidence. Experts tend to review more documents and follow a greater number of links within those documents. Domain experts are especially adept at quickly determining whether or not a given document is useful. In essence, experts often construct queries using numerous highly specific words which act to teleport  them directly to a destination, cutting out the query reformulation often practiced by novices. After having arrived at a destination, experts are then likely to explore the surrounding territory. Designing for experts involves facilitating their teleporting behaviour, helping them get to their destination as quickly as possible. Technical experts like Fane are often willing to learn special commands in exchange for having greater control. Commonly supported operators include AND, OR, and quotes for searching for exact phrases. Image 8: Wolfram Alpha is designed to understand domain-specific terminology and return computed answers. Keyboard shortcuts can also increase the speed of interaction. Google, for instance, allows users to press the up/down arrow keys on the keyboard to traverse results, and press return to go to the URL of the selected result. Image 9: Google places a caret beside the currently-selected result. Experts are more likely to engage with advanced sort and filtering controls than novices, including operations such as selecting ranges, filtering by format, or excluding certain terms (e.g. everything that includes “apples” but does not mention “oranges”). Image 10: Getty Image’s Moodstream lets users search for stock photos using sliders. As-you-type completion interfaces most often display query suggestions to users. However, another use case is to present actual results in the autocompletion interface, enabling users to skip the search results screen altogether and go directly to a specific document. Image 11: Rather than suggesting terms to search for, Nutshell returns search results directly without needing to go to a separate page. Providing links to the top destinations within a result can reduce the number of steps required for the expert to reach his destination. Image 12: Google sometimes provides links to the top-level pages within a given site. While novices and experts practice two very different approaches to information seeking, it’s important not to overemphasis one at the expense of the other. As illustrated by the ancient Chinese symbol, understanding the behaviour of both novices and experts can help us design more informed, balanced search experiences. The author would like to thank Cennydd Bowles for organising the UK writer’s retreat during which this article was written, as well as for the editorial guidance that he provided. Christopher D. Manning, Prabhakar Raghavan and Hinrich Schütze, “Introduction to Information Retrieval”:http://www.cambridge.org/us/knowledge/location/?site_locale=en_US , Cambridge University Press. 2008. Most of the today’s finding interfaces do not support integrated finding effectively, often creating disparate search and browse user interfaces that confound people with a jumble of controls competing for their attention. In this article, I propose the Integrated Faceted Breadcrumb (IFB) design that integrates the power of faceted refinement with the intuitive query expansion afforded by browse. Although other breadcrumb-based finding interfaces currently exist, they fall short of expectations by ignoring design best practices. At best, the breadcrumb is stuck in a role of a side-kick, forced to eke out meager screen real estate along-side more powerful finding controls. In contrast, breadcrumb is the superhero of the IFB design, dealing a decisive blow to many usability issues that plague today’s finding interfaces. To prove this point, I did what we do best – I tested my hypothesis. Twelve evaluators found IFB to be easy to use, intuitive and resourceful for solving complex finding tasks which would be difficult to accomplish using more conventional faceted search interfaces. Unfortunately, most sites today do not integrate faceted search and browse effectively. For example, Walmart.com approaches browse and search using two different interfaces creating a jumble of duplicate controls that overwhelm the customer, making the site more difficult to use, as shown in Figure 1. A veritable cornucopia of filters, links and options on Walmart.com make it unlikely that the customers will be able to duplicate the search successfully or efficiently discover related items and content. Duplicate finding methods also create a problem for natural search, because each finding page exists only within the context of the specific session. To meet the search and browse integration challenges, I propose the Integrated Faceted Breadcrumb (IFB) design solution. A wireframe of the recommended Walmart.com UI redesign that uses the Integrated Faceted Breadcrumb is shown in Figure 2. Findings from the early usability testing of the Integrated Faceted Breadcrumb design using a linked HTML prototype are very promising. Using a simple, 8-page HTML prototype, I tested several variations of this design with 12 current users of popular e-commerce interfaces, people of various genders, ages and backgrounds. Evaluators were able to quickly grasp the range of possible interactions and use the interface effectively to solve complex finding tasks which would be difficult to accomplish with the existing faceted search interface. Most evaluators found IFB design intuitive because it makes liberal use of the existing mental models for breadcrumbs and faceted search. The participants’ confidence and ability to accurately predict system behavior was also observed to be very high after just 1-2 simple tasks; this indicates a fairly short learning curve for IFB design. Although no formal studies comparing the performance of someone using IFB vs. existing faceted finding solutions have yet been conducted, IFB design was strongly preferred by the participants when compared with the existing Walmart.com faceted search design for certain kinds of finding tasks. Short learning curve: familiar links and drop-downs make this control fairly intuitive. People who previously used a breadcrumb can operate IFB effectively. Efficiency: combining breadcrumb and facets into one control makes very efficient use of limited screen real estate and greatly reduces clutter caused by duplication of controls. Unlimited Access: Combined search and browse allow unrestricted access to any page that pertains to the current query. Integration: fully integrates landing pages, brand catalogs and category pages into the faceted search hierarchy. There is one prominent place on the screen to see where you are and access all the navigation tools right where they are needed. Flexibility: customers can switch from search to browse and back again as best fits their needs at each stage of the finding process. Resourcefulness: provides opportunities to widen the search and access complimentary products and services related to the current query. In the following sections, I discuss these design recommendations and explain how Integrated Faceted Breadcrumb compares with some existing faceted breadcrumb solutions. Whether or not the reader decides to adopt all or some part of IFB in their own finding interface designs, I hope the following sections will prove to be a good resource for discussion and further exploration of integrated finding UI designs. In 2002, information architect Keith Instone cataloged the three types of breadcrumbs in his 3rd Annual IA Summit poster with a revealing title: Location, Path & Attribute breadcrumbs.5 In faceted search interfaces, Attribute breadcrumbs commonly convey applied facet values such as price, category, style and brand. Most commonly, Attribute breadcrumbs are Path breadcrumbs, displaying facet values in the order they were applied by the customer to reach the current set of search results. Attribute-Path breadcrumb UI on the Ariba Discovery Network is shown in Figure 3. Temporal breadcrumb cannot be used to effectively link and anchor categories, landing pages, brand catalogs and other browse pages, precisely because it is carrying all of the attribute history instead. Temporal breadcrumb cannot be used to effectively show the customer where they can go because instead it is busy showing them where they’ve been. Pages with Temporal breadcrumbs cannot be effectively linked by natural search, because people creating different URLs each time the content is accessed. When the query changes, attributes appear to “randomly” jump around on the breadcrumb. In contrast, Location breadcrumbs are hierarchical: they do not deal with where the person has been, only with where within the site’s organization they are right now. Hierarchies are very helpful in a wide range of finding and navigating tasks and provide an intuitive way to manage complexity and access resources. How do we determine the hierarchy of Attributes? My research led me to believe that most people find it intuitive when the Attribute-Location breadcrumb simply replicates the order in which un-selected facets are presented (most typically in the left nav bar). Replicating the order in which un-selected facets appear also provides an effective way to integrate search and browse by treating the Category as just another Attribute in the breadcrumb. In vast majority of finding interfaces, Category appears first in the left nav bar, which places any applied “browse” Category Attributes in front of the applied faceted search values. Most of the people found the Integrated Faceted Breadcrumb hierarchy straightforward and intuitive and were able to confidently and accurately predict the expected system behavior for complex filtering tasks that involved applying, removing and changing filter values, after spending only a few minutes working with the system. Instead of removing Canon in order to select Nikon, most people think in terms of simply changing Canon to Nikon, which can be accomplished most readily with a drop-down control. The drop-down is more intuitive than a typical remove mechanism, as it allows the user to discover all of the navigation options available from the parent facet or category. This idea was first introduced by Luke Wroblewski in his excellent book Site Seeing: a Visual Approach to Web Usability.6 One of the sites that implement drop down in the breadcrumb is Edmunds.com, shown in Figure 6. In my testing, vast majority of people preferred this design to a more common set-remove-set paradigm and found it very intuitive and effective. In my research, I found that people seldom want to start the query over completely from scratch, unless they specifically indicated this action. Instead, they wanted to retain as much of the query as possible with every change of the facet values, and expect the system to help them construct a query that “makes sense”, gracefully dropping facet selections that no longer apply to their new query. Unfortunately, few sites today implement this function well. For example, changing the model from Mustang to Fusion does not retain the year selection of 2005, as most people would expect. Instead, as shown in Figure 7, Edmunds.com resets the model year to the current year, 2010, which simply disappears from the breadcrumb. I found that a more resourceful system behavior is to retain any relevant attribute values that apply to the new query, preferably in way that always produces some search results. Figure 8 shows how Integrated Faceted Breadcrumb design handles the change in the Product Type from Digital Cameras to Lenses, retaining the Brand and Keywords aspect, while dropping the Camera Resolution aspect (as it does not apply to Lenses). Retaining aspects that apply to the updated query allows the customer to concentrate on their finding goals, while the system takes care of the details. What if the person really wanted to browse just the Lenses Product Type? My testing showed that most people found it very intuitive to click the Lenses link in order to navigate to the Lenses Product Type landing page. The result of combining drop-down control functionality with the existing breadcrumb link interaction gives us a powerful, intuitive, flexible finding control. What if instead of browsing, someone wanted to remove a single applied aspect from a breadcrumb, leaving the rest of the query intact? My research showed that most people found it easy and intuitive to navigate to the drop down and select “See All” option Integrated Faceted Breadcrumb design provides at the #1 position in the drop-down, as shown in Figure 9. While most applications simply display the applied aspects in the breadcrumb, my research shows that labeling each of the applied aspects with the aspects name adds a great deal of information scent. The resulting IFB “breadcrumb tiles” (shown in Figure 9) display relevant aspect labels which help customers make sense of their queries and orient themselves quickly if they find the page through natural search. Ariba interface in Figure 3 has a single search box which retains the original keywords, in a manner similar to Google. Unfortunately, any keyword change drops all of the applied aspects and filters launching a new keyword-only search. This is obviously not very resourceful, as we are trying to retain as much of the query as possible for reasons explained above. In contrast, Integrated Faceted Breadcrumb (IFB) provides a dedicated “New Search” button on the Home breadcrumb tile. As shown in Figure 10, clicking the “New Search” button removes all aspects and keywords, resetting the breadcrumb to the full-screen text box, reminding many evaluators of the simplicity of the Google search. Resetting is accomplished via an HTML layer or similar device so that the rest of the content on the page does not change. This way, the search box can reset almost instantaneously, perhaps even with an elegant animated transition. Many faceted search interfaces like Overstock.com pictured in Figure 11, have two search boxes: one to “search within” the existing query, and one to start over with a new keyword-only search. Having two search boxes takes up precious screen real estate and increases the potential for confusion. Worse yet, the customer can not directly modify their keyword query after the search is executed, because the system converts all the keywords into an aspect which cannot be modified, only removed in its entirety. In his seminal book, Designing the user interface: Strategies for effective human-computer interaction8, Ben Shneiderman describes direct manipulation is one of the key HCI design principles. Integrated Faceted Breadcrumb (IFB) provides direct keyword query manipulation with the dynamic editable Keywords Aspect shown in Figure 12. At the start of a finding session, the search box starts out fully expanded across the entire width of the page. When the customer types in some keywords, they are retained in the search box for easy editing or keyword addition, as shown in Figure 12-A. If the customer selects one or more facets, they are always added according to their respective hierarchy in front of the search box. As more aspects are added, the keyword box gets progressively smaller, until it reaches some reasonable minimum size as shown in Figure 12-B. If sill more facets are applied at this point, a scroll arrow appears immediately after the Home facet, allowing customers to scroll only the applied aspects in the manner of a carousel control, without ever hiding the Home facet or the search box, as shown in Figure 12-C. IFB dynamic editable Keywords Aspect design proved to be very successful with our evaluators who found it intuitive, resourceful and easy to use. Bruce Sterling, in his brilliant and entertaining book Shaping Things9, mentions Raymond Lowey and his very useful acronym MAYA. Faceted breadcrumb designs have only recently began to move out of being Most Advanced (the domain of academics and computer geeks) and toward becoming Acceptable to the general internet public. Faceted breadcrumb holds in my opinion the promise to become the key component in the next generation of intuitive finding interfaces that fully integrate the best of faceted search and browse capabilities. I hope this article will assist anyone designing a faceted finding interface and helps move faceted breadcrumb designs, like the Integrated Faceted Breadcrumb, one step closer to the edge of MAYA, helping make resourceful integrated finding a commonplace reality. I look forward to continuing the discussion of IFB in the article comments thread and on Twitter “@DesignCaffeine”:http://twitter.com/designcaffeine. 2 “Search User Interfaces”:http://searchuserinterfaces.com/book/sui_ch8_navigation_and_search.html book.